Keep your business running smoothly with our commercial skip hire. A few hours of downtime can cost your business a lot of money if you have waste that is hanging around and hindering your team working. We are available 6 days a week so you never need to worry about not having a skip or a way to remove your commercial waste. Need one today? Not a problem. If you call before 12pm we can provide a same-day delivery of your skip. Caerphilly Skips can help you remove your commercial and industrial waste in an easy way with one of our skips, taking the stress out of waste management and skip hire for you. We have a variety of skip sizes available and will help you understand and decide which skip and service suits your commercial waste needs. If you are running a building site and need a skip or skips to remove waste from your site then we can help. Our roll on roll off skips will help you and your team to easily and quickly dispose of all the debris you have on site, making it safer and enabling you and your team to work more quickly. Our wait and load service enables you to remove large quantities of waste without having a skip taking up space on your site. Our team will wait whilst the waste is loaded and remove it when the skip has been filled. We will agree a time for your skip delivery and can estimate with you how long it will take for the skip to be filled. If you are considering this service then to make the most of it you should have all your resource available to fill your skip at the time it arrives. If you are completing an office or shop renovation then you may only need a maxi skip or two. Our expert skip team will always help you decide which is the best skip and service for your business needs. At Caerphilly Skips we offer a 24-hour, 6-day delivery service with a same-day response and skip delivery in the local area if you order before midday, and guaranteed next day delivery service after midday. Over the years, the quality and versatility of service we offer has helped build an impressive client of local companies in both the public and private sectors and we are known for our professional and speedy service in the skip industry. We don’t charge rental for short-term hire of skips and can supply road permits on request. Taking care of a permit isn’t something you need to worry about when hiring a skip from us as we can take care of it for you. If you don’t have anywhere to store your skip then our wait and load service is ideal for you. The service eliminates the need for an on-road permit, guaranteeing that your waste is disposed of the moment you have filled the skip, as well as saving you up to £65 for a permit. We are industry professionals and our expert skip team will know exactly which skip and skip service you need when you call to place an order with us. At Caerphilly Skips we offer a wide range of skips, sizes and services, delivered straight to your door and we offer all our customers a reliable and professional solution for their Commercial Waste Management every time. We advise that you go one size bigger skip than you initially think as you will always have more to dispose of than you initially estimate. 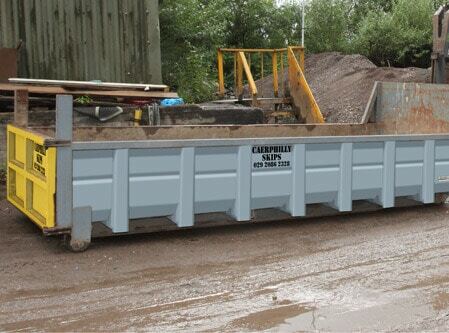 Increasing the size of your skip is minimally different in cost and less than having 2 skips. Caerphilly 8 Yard Builder Skips are good if you are doing an extensive home renovation and have building waste to remove quickly. Our 8 Yard Skips known as our Builders Skips carry quite a load and need a permit for it to be placed in front of a building or on the road which we can organise for you with no commission charged. Caerphilly 12 Yard Maxi Skips are great for bigger items and when you have a lot of waste to remove. We can arrange on-street permits for our customers and do not charge any commission to arrange this for you, saving you time and utilising our specialist knowledge. Caerphilly Roll-on Roll-off Skips is the most effective skip for any large building job, site clearance and extensive home renovation. The titan of skips can handle an extremely big load and it ensures you don’t need to order multiple smaller skips to remove your waste. We can arrange a permit for this huge skip for on-street purposes and do not charge you a commission to do this. 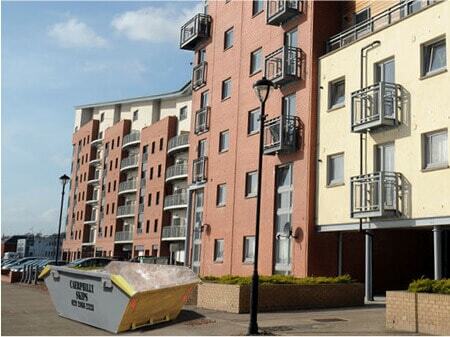 Caerphilly Unique Skips include our easy fill skips and enclosed skips. They are built to fulfil specific needs to ensure privacy, protection and straightforward filling for weighty objects. They come in every size regardless of their special design. Caerphilly Skips Wait and Load Service enable you to fill your skip whilst we wait and when you are done our team will load and remove your skip instantly. The benefit of this service is you don’t have to have room on site to store your skip and there is no permit charge. Our wait and load service is best if you are well prepared and have your resource available to fill your skip quickly. Contact us today to find out more and to order your skip.